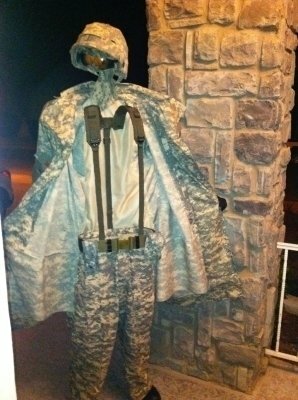 Invisible Soldier Costumed Character. This Invisible Soldier has been embraced by all. When Ex-Military and current Military ask us to explain our Invisible Soldier we let them know, This Invisible Soldier represents, all our military with the highest regard and honor to all that serve and keep us safe throughout the world. We represent this costume to all weather you served out country or want to show your support to those that have served our country. All the Military that has been Lost in Service, For all of the Families that mourn the loss of their Loved ones. And for all of the Military that return home with injuries and find themselves Invisible..! 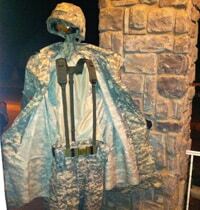 The Invisible Soldier Costume Character has been all over the United States representing our soldiers in the highest regard and is an Award winning costume creation. Weather you are saluting our military or for any event or party you are having. Is great for parties and fairs and festivals nationwide. a wonderful and historic photo opp. for all. Available Nationwide and will come with Talent to wear costume.